One of my most recent Eastern Europe travel stops was Varna, Bulgaria. Varna is a port city located on Bulgaria’s Black Sea. It is actually the largest seaside city off of the famed Black Sea coast. 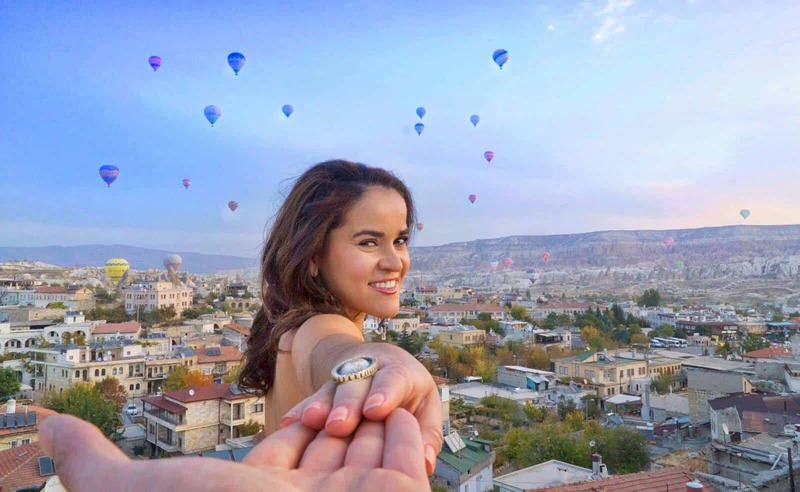 This city is also known as the “Gold of Varna” (The Oldest World Jewelry in the world – Dating to 4200-4600 BC ) due to the 6,000-year-old Thracian jewelry discovered in a necropolis, which is displayed inside the Archaeological Museum, along with Greek, Roman and Ottoman antiquities. 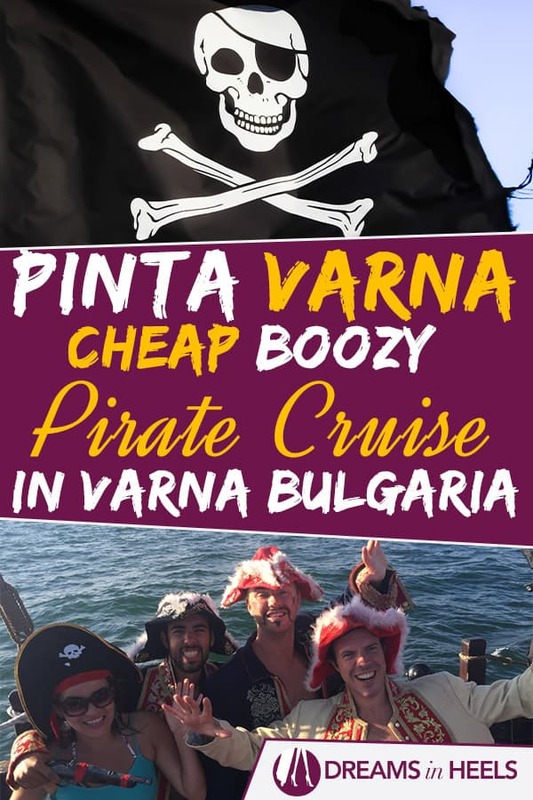 In addition, you will hear lots of pirates stories, which is how I became interested in a Pirate Cruise in Varna. Fun Fact: The Battle of Varna (in 1444) was one of the last battles of the crusades. 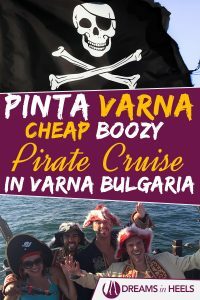 Aboard a fun pirate cruise, Pinta Varna in Bulgaria! 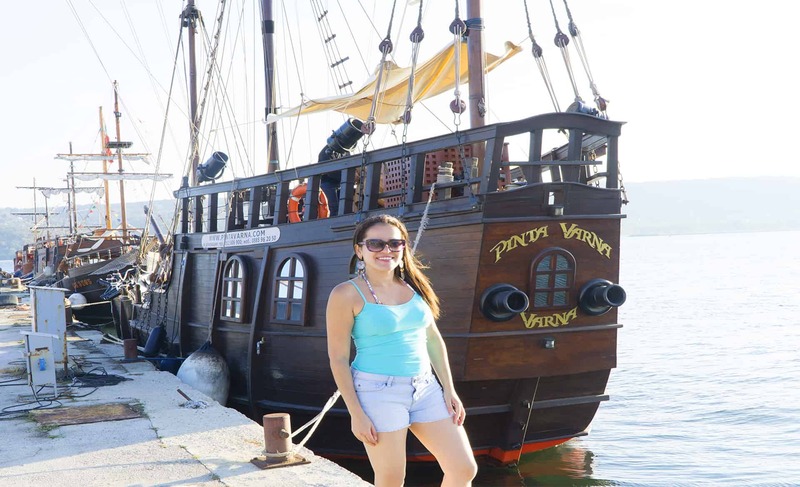 As I was walking around the port, I found this fun pirate cruise in Varna, called the Pinta Varna. It was very hot and this activity is perfect for a beautiful summer day. How long is the cruise and what is the cost of it? The cruise takes you around the sea for close to 3 hours and the best part, aside from the amazing views, includes beer, non-alcoholic and nuts (sweet and savory) all for less than $20. I was surprised at the reasonable cost. Honestly, it was well-organized and super funny, with excellent costumes and pro actors. There are several activities during the sailing. The music is poppin’ (I even heard some fun latin music mixed in) and there’s lots of singing and dancing. 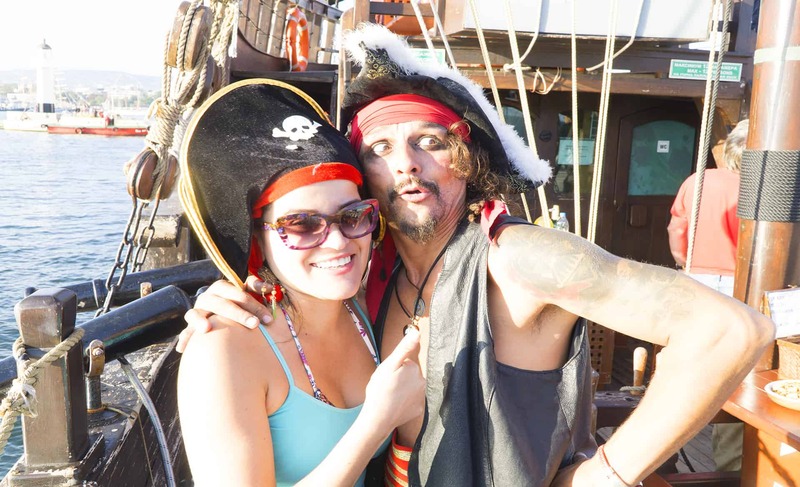 They also give you a pirate hat to wear, and if you request it, you can dress up further with make-up and other props. I had a blast! What do you do for 3 hours? I don’t want to give too much away but shortly after setting out you are “attacked” by another ship that fires upon your ship. You can return fire with water cannons. As the enemy approaches, bells ring, the cannons are manned and by the end you are thoroughly drenched. The pirates on board simulate like they are stealing your valuables at “gunpoint” and I was almost kidnapped by a pirate. They also had contests and games for us to play. For example, we had to perform singing and/or dancing to get our stolen goods back. There are photo opportunities with the pirates, arm-wrestling and more. After all of this, you get treats then a delicious lunch. It is truly an unforgettable experience. 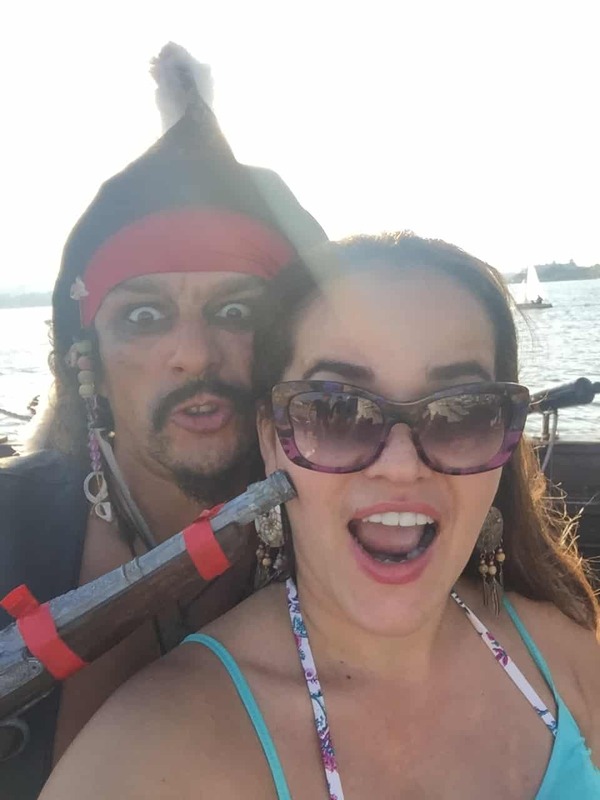 Bulgarian Captain Jack Sparrow and the support crew are super entertaining and friendly. 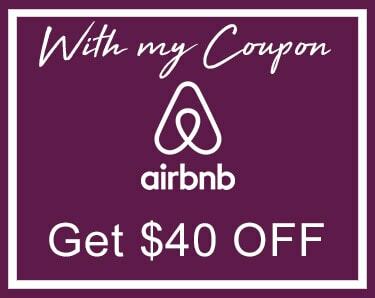 It makes for an excellent day and great value for your buck. All of this fun and for only 20 bucks; a true deal! 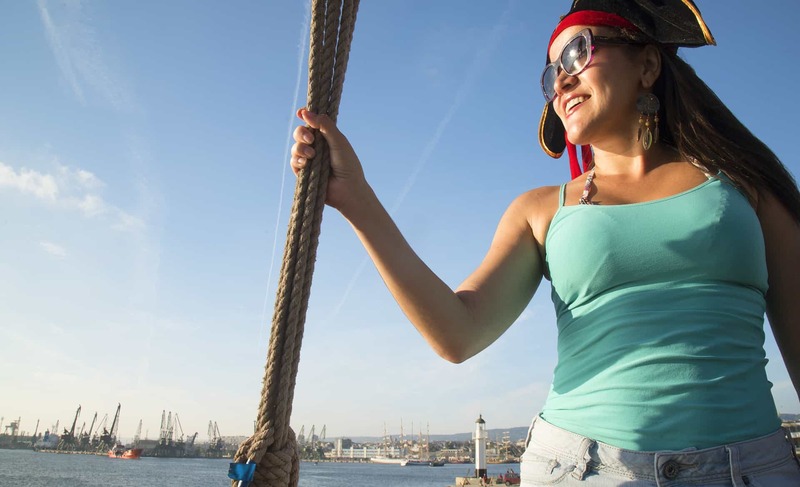 Have you ever been on a pirate cruise in Varna or anywhere else around the world? Share your experience by commenting below.